The Lyman 140th Anniversary Sharps Carbine, made exclusively for Lyman by Davide Pedersoli®, is now shipping to firearms distributors and dealers. 140th Logo 3inch.jpgMiddletown, Conn. (August 2018) – Lyman® Products, celebrating 140 years in business, unveiled the new 140th Anniversary Lyman Sharps Carbine Model in April of 2018. Designed by the internationally renowned Italian Firearms Group, Davide Pedersoli®, the limited-edition model is now shipping to distribution throughout the United States. The 140 rifles will be serialized from 1 to 140. The Lyman Sharps Carbine is a streamlined, lighter weight version of the 1878 model, also made by Pedersoli. The Sharps Carbine is chambered in 30-30 Winchester and equipped with a Lyman #2 Tang sight, (one of the original sights that gave Lyman their start 140 years ago) with the front pivoting to allow the shooter to choose between a blade sight or a globe style bead sight. 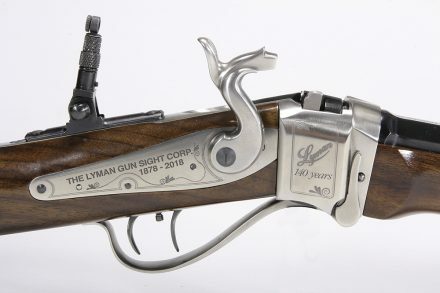 The rifles are engraved with “Lyman Gun Sight Company 1878 – 2018 140 years” on the brushed nickel receiver. The rifle sports a 24” barrel and weighs in at seven pounds. MSRP is $1,999.95. This entry was posted on Monday, August 20th, 2018 at 23:23	and is filed under Press Release, Weapons. You can follow any responses to this entry through the RSS 2.0 feed. Both comments and pings are currently closed.